Servers for the Contracts mode were shut down in May 2018. Hitman Absolution: Professional Edition includes 72-page Digital Artbook, The Making Hitman Absolution video, and the Agency Gun Pack DLC. 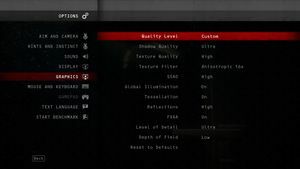 Hitman Absolution: Elite Edition includes the Professional Edition and all DLC. The OS X version includes all Elite Edition content. All purchases now include Hitman: Sniper Challenge which was previously a pre-order exclusive. Japanese language support is only available in Japan; this version only includes Japanese text and Japanese and English audio. Purchasing DLC is no longer possible due to the Contracts mode servers being shut down. Menus and FMV cutscenes are pillarboxed 16:9. Turn off "Exclusive Fullscreen" under Display to use borderless mode. FXAA, up to 8x MSAA. Can be fixed by launching the game using Controller Companion application. Japan only; only includes Japanese text and English and Japanese audio. 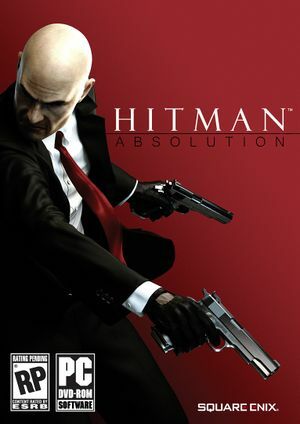 See Helix Mod: Hitman Absolution. 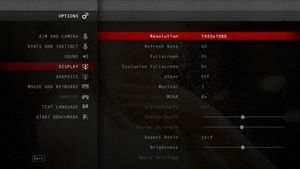 This should fix issues with huge FPS drops that come from opening doors or cutscenes. In Windows 8.1, sometimes the game will appear to start minimized, and any attempts at restoring the game will not work. It seems Nvidia have set the default Vcore too low on the 5xx/6xx series cards. They do pass stress testing but crash in a few Real World DX11 intensive games. ↑ 1.0 1.1 File/folder structure within this directory reflects the path(s) listed for Windows and/or Steam game data (use Wine regedit to access Windows registry paths). Games with Steam Cloud support may store data in ~/.steam/steam/userdata/<user-id>/203140/ in addition to or instead of this directory. The app ID (203140) may differ in some cases. Treat backslashes as forward slashes. See the glossary page for details.